French philosopher and encyclopedist; born at Langres Oct. 5, 1713; died at Paris July 30, 1784. Although, like all the French encyclopedists, an apostle of tolerance, Diderot does not seem to have had much sympathy with the Jews and Judaism. 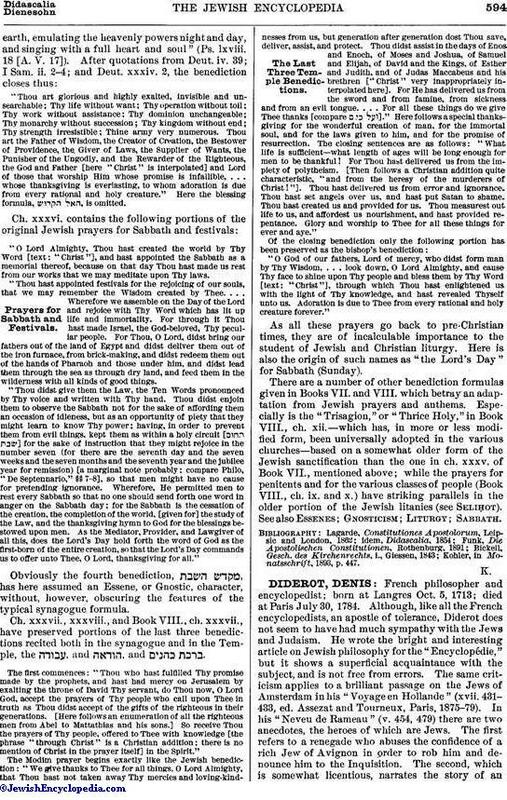 He wrote the bright and interesting article on Jewish philosophy for the "Encyclopédie," but it shows a superficial acquaintance with the subject, and is not free from errors. The same criticism applies to a brilliant passage on the Jews of Amsterdam in his "Voyage en Hollande" (xvii. 431-433, ed. Assezat and Tourneux, Paris, 1875-79). In his "Neveu de Rameau" (v. 454, 479) there are two anecdotes, the heroes of which are Jews. 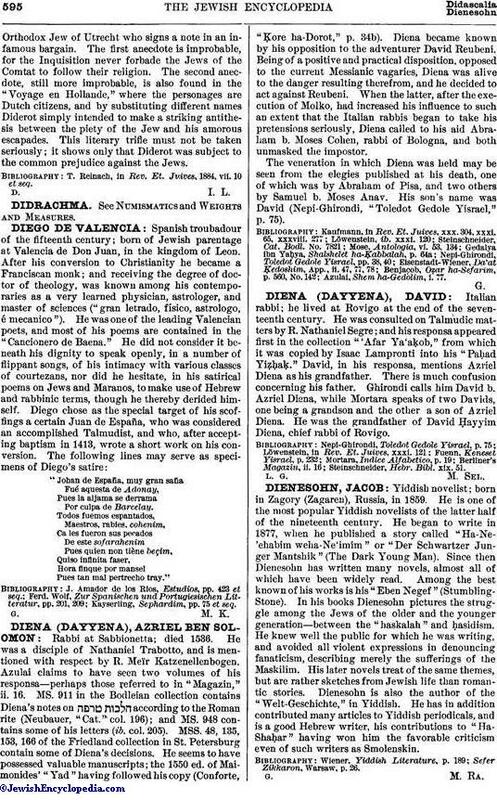 The first refers to a renegade who abuses the confidence of a rich Jew of A vignon in order to rob him and denounce him to the Inquisition. The second, which is somewhat licentious, narrates the story of anOrthodox Jew of Utrecht who signs a note in an infamous bargain. The first anecdote is improbable, for the Inquisition never forbade the Jews of the Comtat to follow their religion. The second anecdote, still more improbable, is also found in the "Voyage en Hollande," where the personages are Dutch citizens, and by substituting different names Diderot simply intended to make a striking antithesis between the piety of the Jew and his amorous escapades. This literary trifle must not be taken seriously; it shows only that Diderot was subject to the common prejudice against the Jews. T. Reinach, in Rev. Et. Juives, 1884, vii. 10 et seq.